“Thousands Gladly Acknowledge That Health and Life Are Due to Colorado Springs,” reads a 19th-century pamphlet advertising the city. Colorado Springs’ roots lie in its purpose as a health and wellness city, as “The City of Sunshine,” where tuberculosis patients flocked in search of treatment in the late 19th century. In the era before antibiotic treatment for tuberculosis became available, fresh, dry, mountain air and sunshine was thought to rid the lungs of tubercular bacteria. It’s estimated that in the late 1800s, people afflicted with tuberculosis constituted at least one-third of the city’s population. Once the largest industry and economic driver in Colorado Springs, tuberculosis treatment shaped the city’s development and architecture in the years leading up to World War II. Today, though the evidence of the city’s past with tuberculosis appears subdued, the infrastructure originally built to support treatment of the disease remains. Some of it even hides in plain sight, just steps away from Colorado College’s campus. This project emerged in response to my own curiosity about the city’s past as a nucleus of treatment, and is only a cursory glimpse into the history of tuberculosis in Colorado Springs. Colorado Springs was home to upwards of 15 tuberculosis sanatoriums—residential treatment centers for tubercular patients—during the 19th and early 20th centuries. Sanatoriums housed common areas for dining and recreation, along with a score of offices and medical facilities. Each admitted patient would spend the day milling around these spaces and then would return to their personal eight-sided Gardiner tent (pictured above) at night. The Modern Woodmen of America Sanatorium, pictured here, was one of the largest sanatoriums in the region. Founded and operated by the fraternal benefit society of the same name, this sanatorium treated members of Modern Woodmen for free. Each sanatorium was known to have its own personality, patient profile, and level of accessibility—some facilities demanded higher payment and provided amenities, while others remained less costly and more bare-boned. This Gardiner tent now sits alongside a parking lot at Penrose St. Francis Hospital, a former sanatorium. The tent’s interior—which includes only a scant cot and dresser—has been reconstructed as a model of what a sanatorium patient’s living space looked like. Today, the former sanatoriums themselves have been repurposed: Glockner Sanatorium is now Penrose St. Francis Hospital, Cragmor Sanatorium constitutes academic buildings at the University of Colorado at Colorado Springs, and Montcalme Sanatorium operates as Miramont Castle, a local history museum in Manitou Springs. The structures that once configured these treatment centers, including Gardiner tents, now hide in the city’s crevices. Sanatorium patients often lived in Gardiner tents year-round, come sun or snow. The patients’ willingness to endure severe, cold weather conditions in poorly-insulated tents attested to the deep-rooted belief that fresh Colorado air killed the disease. Many of the people seeking treatment in Colorado Springs did improve, and sanatoriums claimed that about 60 percent of patients were cured of their tuberculosis. Most facilities, however, refused patients in highly-progressed stages of the disease. It’s now believed that, rather than “fresh air,” lower levels of oxygen were responsible for improvements in the health of tubercular patients. Less oxygen prevented tubercular bacteria from reproducing and surviving easily. This, coupled with the common sanatorium regimen of lots of rest and high-caloric diets to promote weight gain (tuberculosis was known to “consume” the body, or greatly diminish body weight) often promoted recovery in those affected by the disease. The invention of antibiotics during World War II presented a new and effective way to treat tuberculosis. By the late 1940s, with the need for sanatorium treatment quickly diminishing, the facilities began to disband. Gardiner tents assumed new roles as tool sheds and backyard storage units. In some cases, huts were repurposed to serve as homes for local businesses. Totally Nuts & Company in Manitou Springs operates today in two attached Gardiner huts. 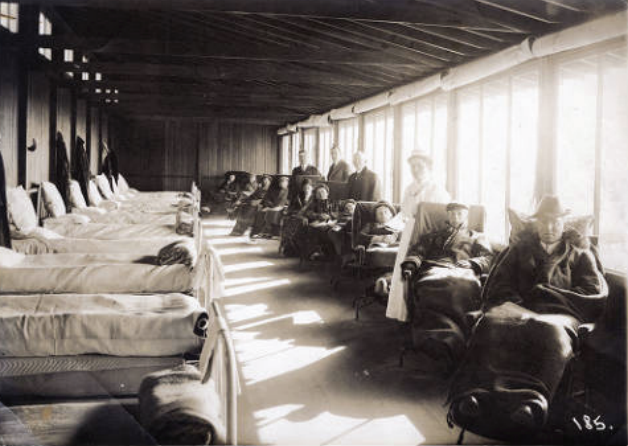 In both sanatorium and home treatment, heliotherapy (the therapeutic use of sunlight) was one of the most popular and utilized forms of treatment. Patients spent warm days sunbathing, and cooler days lounging behind the large glass windows of sleeping porches. Home treatment was also a popular method for those who could afford it. 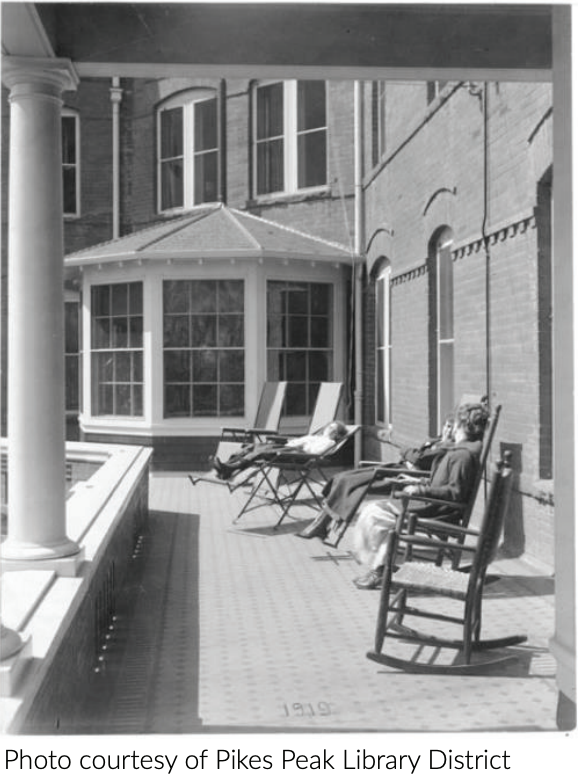 Families living with a tubercular patient often added sleeping porches to their houses, allowing for heliotherapy and exposure to fresh air within the home. These porches distinguish the Old North End neighborhood, where many houses still have fully-intact porches or structural skeletons of where the porches once were. This porch juts out of the second floor of a house now occupied by Colorado College students. Today, Colorado Springs’ military presence stands in place of the tuberculosis treatment industry. The sanatoriums are gone, only a handful of Gardiner tents remain sprinkled around town, and little thought is given to the glass sleeping porches dotting the city. Still, the history of tuberculosis treatment lives on through these spaces. Colorado Springs is no longer commonly referred to as the “City of Sunshine,” but owes much of its infrastructure, large population, and position as a city on the map to its tuberculosis treatment history.